Are you interested in fun and outdoor adventures? Then scouting is the place for you! Contact CubMaster Matt Hill @ 615-870-9989. If you have never been involved with Scouting, not a problem. 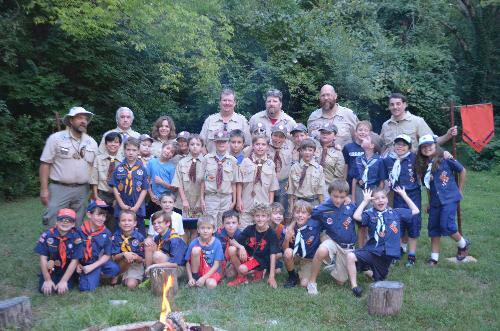 Cub Scouts are open to boys in 1st through 5th grade. This means you 1st graders. For questions please feel free to contact Cub Master Matt Hill at 615-870-9989. · Provides a well-rounded program positively affecting every area of a boy's life. · Encourages boys to achieve a deeper appreciation of others, including peers, parents, and other adults. Early in their Cub Scouting experience, boys learn the value of serving others. · Gives boys with a sense that they are important as individuals. They learn that their scouting family cares about what happens to them. · Promotes activities that lead to personal responsibility and high self-esteem. As a result, when he has to make a hard decision, a boy can look in the mirror and be proud of himself.